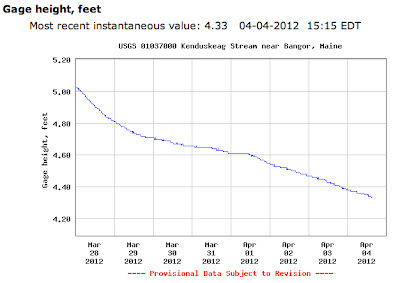 Some people are expressing concern about the water levels of the Kenduskeag (and other streams) this year. Which is understandable, because most of Maine has seen a very mild winter with what seems like very little precipitation. Especially lately! But the stream remains passable as of this writing. 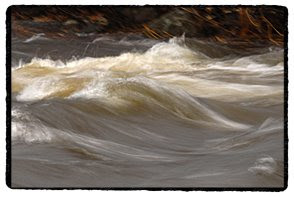 And water levels fluctuate rapidly on the Kenduskeag going one way or the other, so for now I suggest that we relax, keep an eye on things, and hope for the best. And don't believe any wild rumors you might hear about the race being cancelled. It hasn't been cancelled. It might help to know that several long-range weather forecasts call for rainy days leading up to race day. According to one forecast, it might even be rainy on race day itself! I usually take these long-range forecasts with a grain of salt, but who knows? Let's keep an eye on it and keep our fingers crossed for rain if the stream continues its downward slope. There's no way to know how much rain we will get, if we will get any at all, or how it will affect the stream at this point. I'll post updates here as well as on the Kenduskeag Facebook page as we get closer to race day. If the Passy River Race was an indication of things to come, the Kenduskeag could be a wild & wooly ride. We'll have to keep an eye on the local precipitation over the next twelve days. Next up: The Souadabscook Stream Canoe Race and the Marsh Stream Sprint/Race, next Saturday and Sunday, respectively. By the way, here are my photos from the Passy last Saturday.